The new stairs are now complete! The glass was installed about 10 days ago and this has really brought it all together. 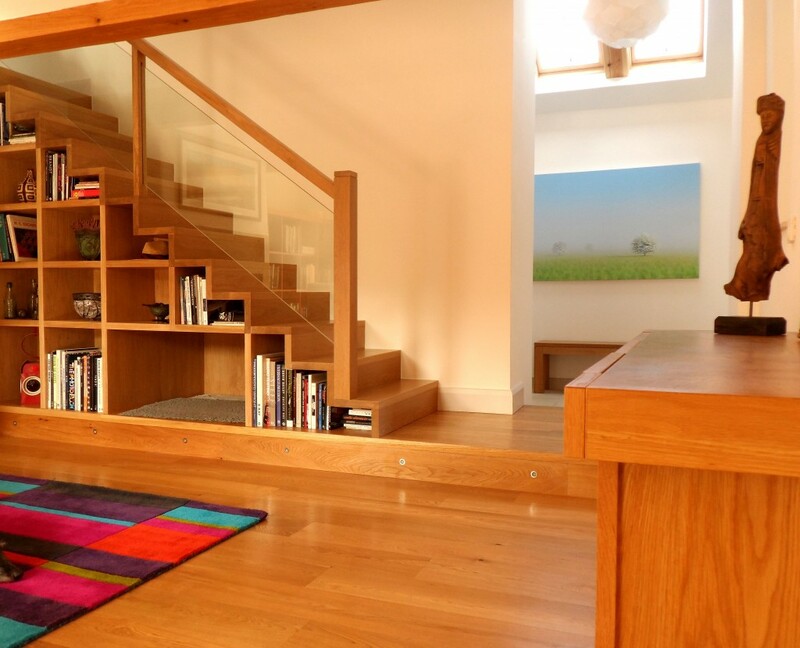 There are two pieces of 10mm toughened glass installed as part of the balustrade. The glass is held in place with by grooves in the supporting woodwork. This not only simplifies the design, but also gives the illusion that it is one piece of glass and not two. 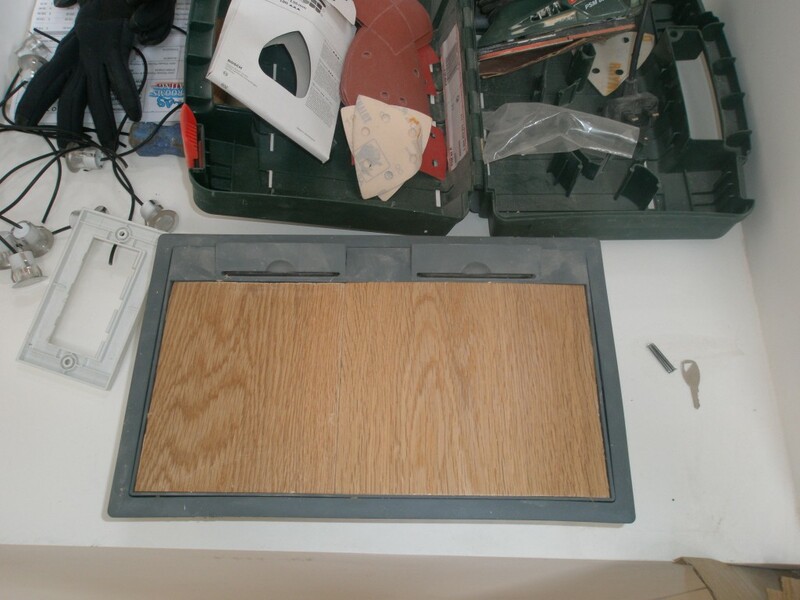 We have a spare back and a spare vertical divider that can be installed where the dog’s bed is currently installed. 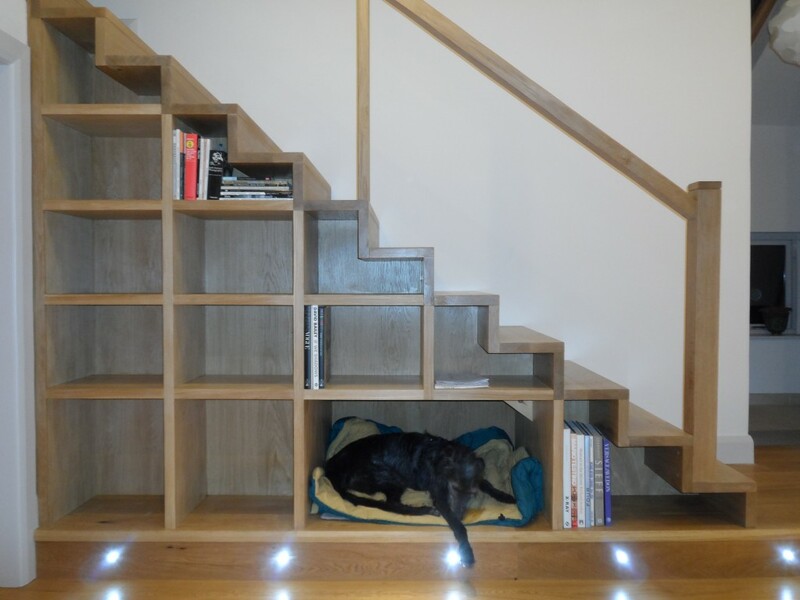 This means that if we no longer have a dog, or sell the house to someone who doesn’t have a dog, then the area for the dog’s bed can be configured as two cubby holes that match the others. 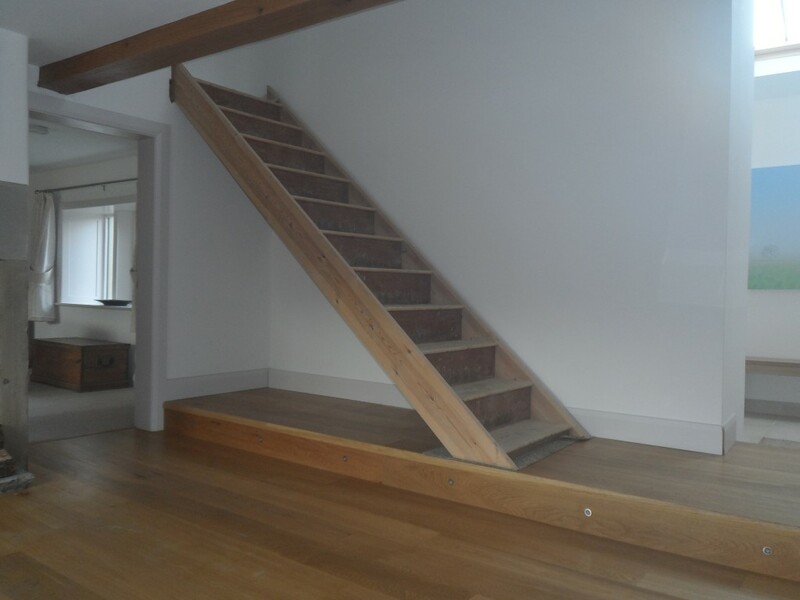 We are really pleased with the stairs and are delighted that, once again, we have been able to rely on local trades people to do an excellent job. 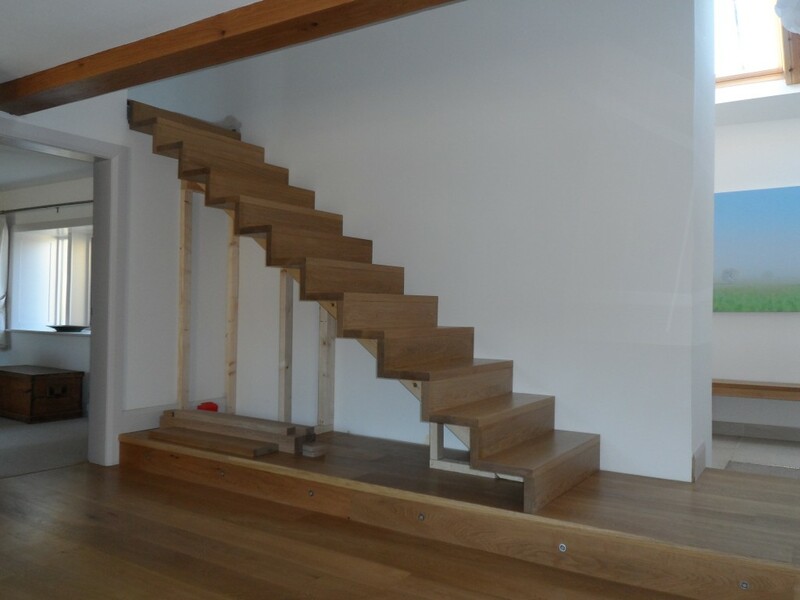 The stairs were built by Huddersfield Joinery who also produced all of the hardwood windows for the property. There are LED lights built into the wooden plinth and, at night, these come on if anyone walks into the hall or the upstairs landing. You can see these on in some of the earlier photos of the stairs – just scroll down. This is achieved using the PIRs for the burglar alarm with the lighting computer. I have a spare LED light and I am tempted to install one in the old road lantern on the bottom shelf in the stair bookcase. 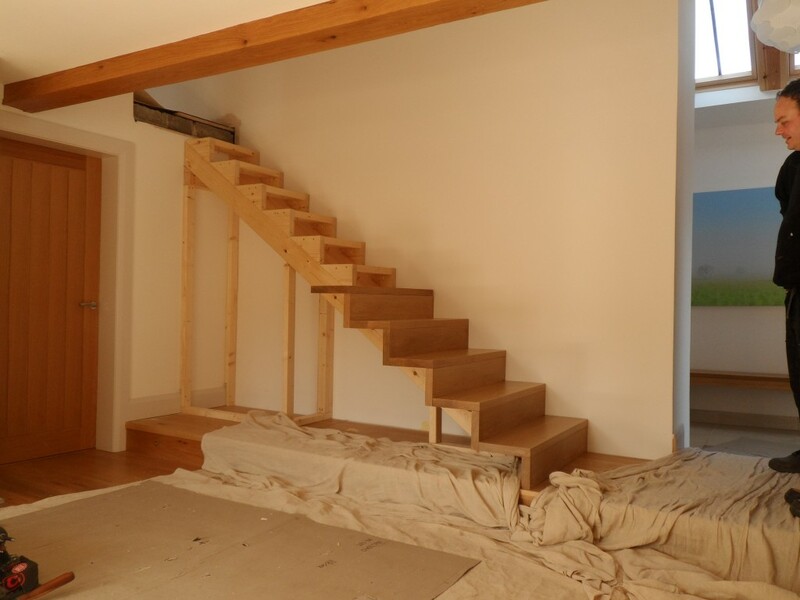 We have still to install the “eyelid” lights that follow the line of the stairs. 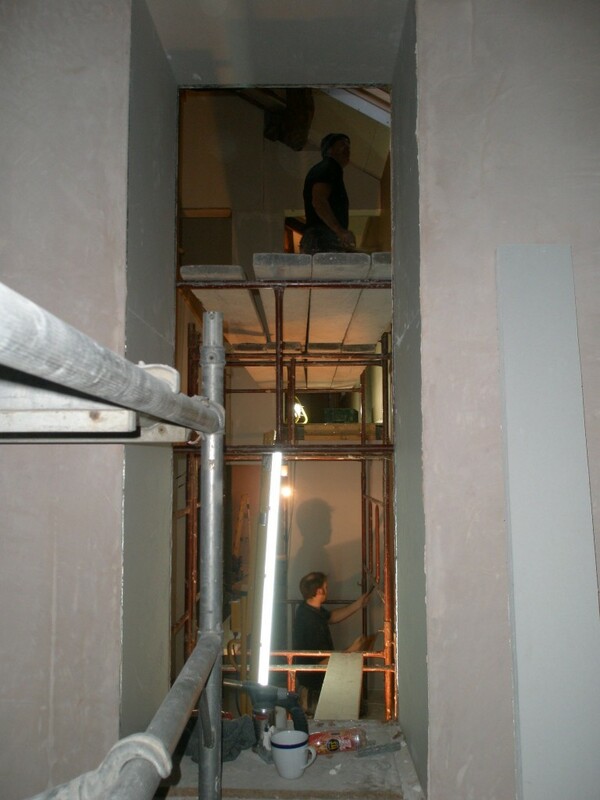 The wiring was installed behind the plasterboard in readiness for the lights. I just need to find some that will work well in this space. The two pieces of glass are held by grooves that have been routed into the supporting posts. 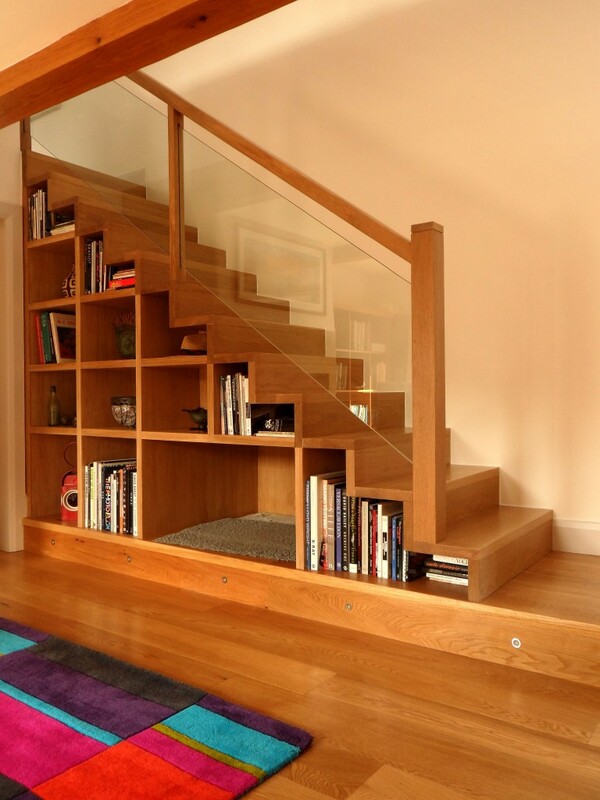 This simplifies the overall design as well as it making it look as if it is one piece of glass that goes up the stairs. 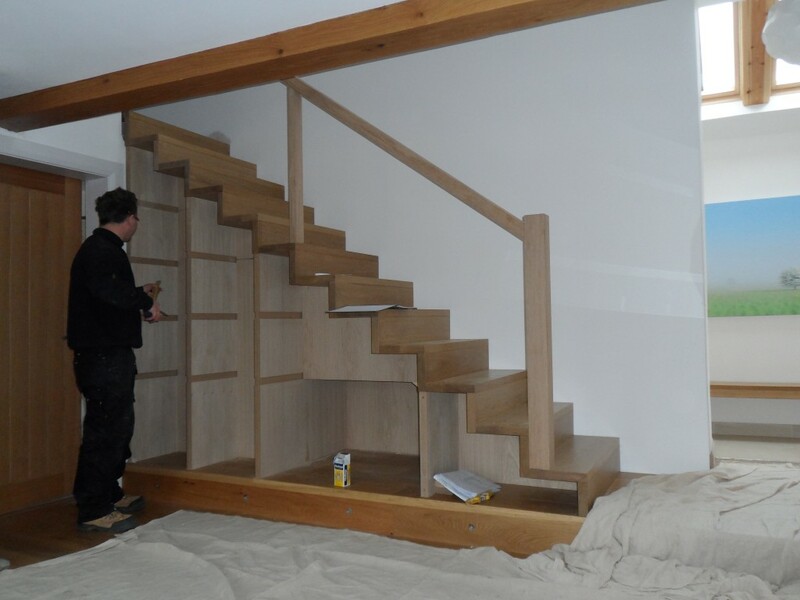 We are getting there with the stairs and the shelving was installed underneath the stairs on Friday. It requires 2-3 coats of varnish, but this will have to wait until Monday. 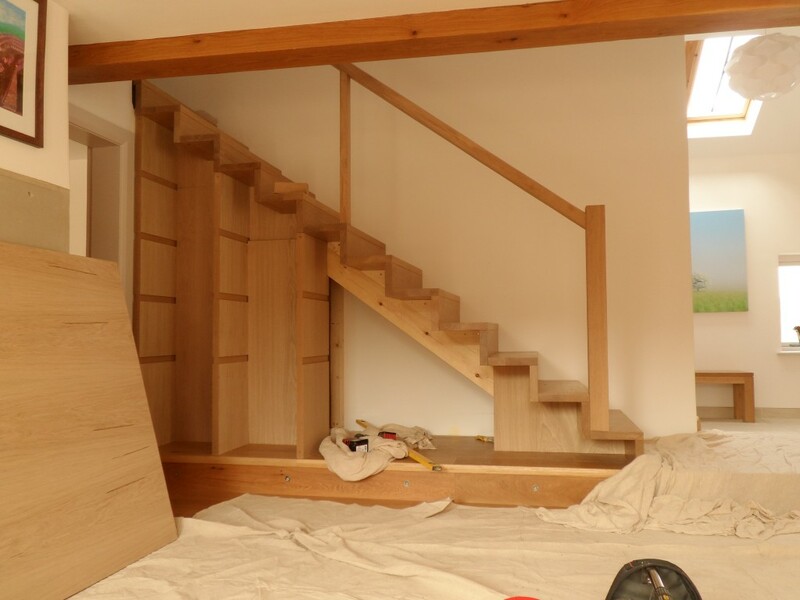 The two pieces of glass for the balustrade should arrive early next week, so everything should be finished on the stairs by the end of next week. 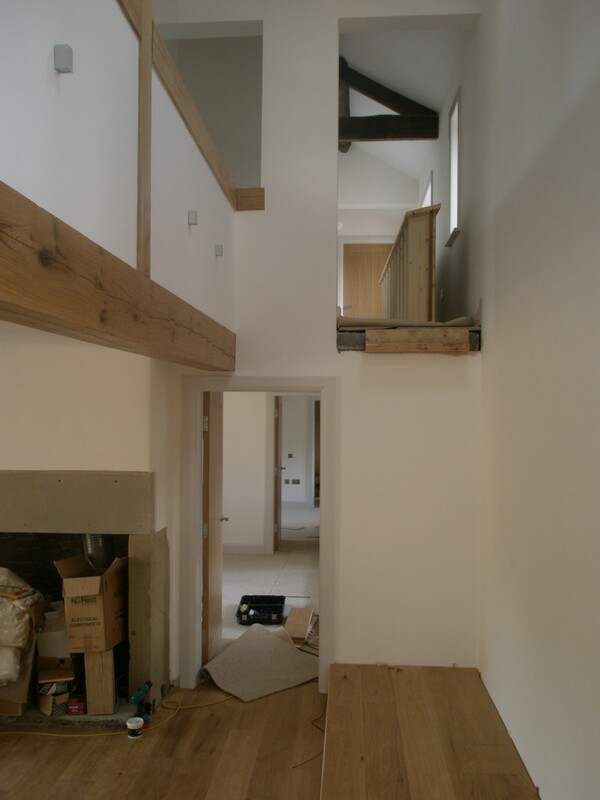 We now have all of the verticals and horizontals in place that make up the shelving under the stairs. It needs 2-3 coats of varnish and the glass needs to be installed underneath the handrail. 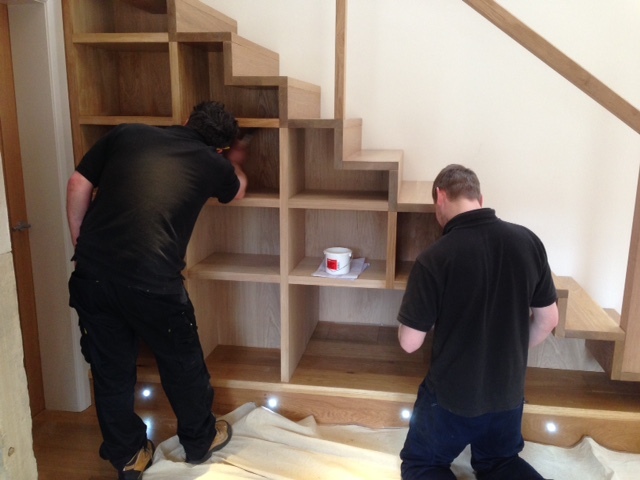 Craig and Jake from Huddersfield Joinery (this is all their handy work!) varnishing the newly installed shelving. With the shelving now in place, we couldn’t resist putting a few books in it to see what it might look like once it is full. The dog took to sleeping underneath the stairs when the temporary stairs were in place. We have separate divider where the dog’s bed is situated – if we ever don’t have a dog, the divider can be slid in so that it looks like the rest of the shelving. We are starting to build the shelving underneath the stairs. We have started on the shelving underneath the stairs. 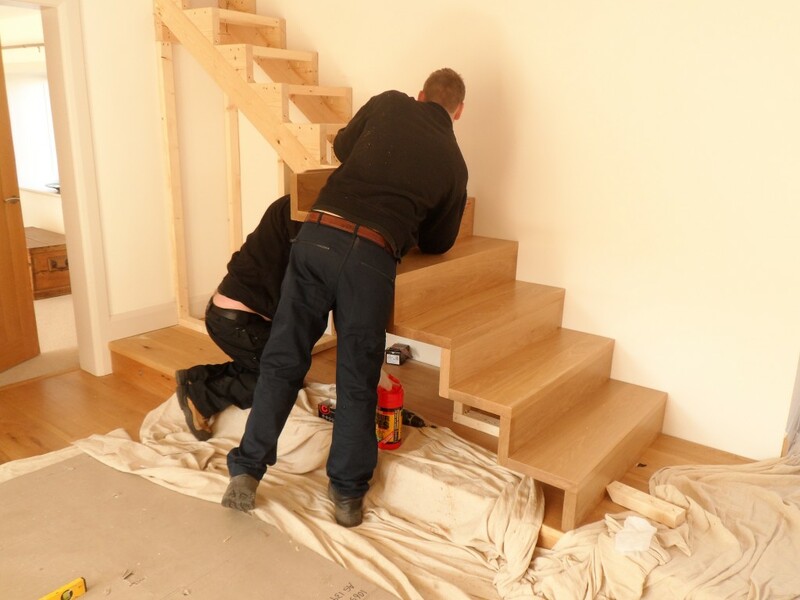 These are being fitted into the stairs that we built earlier in the week. 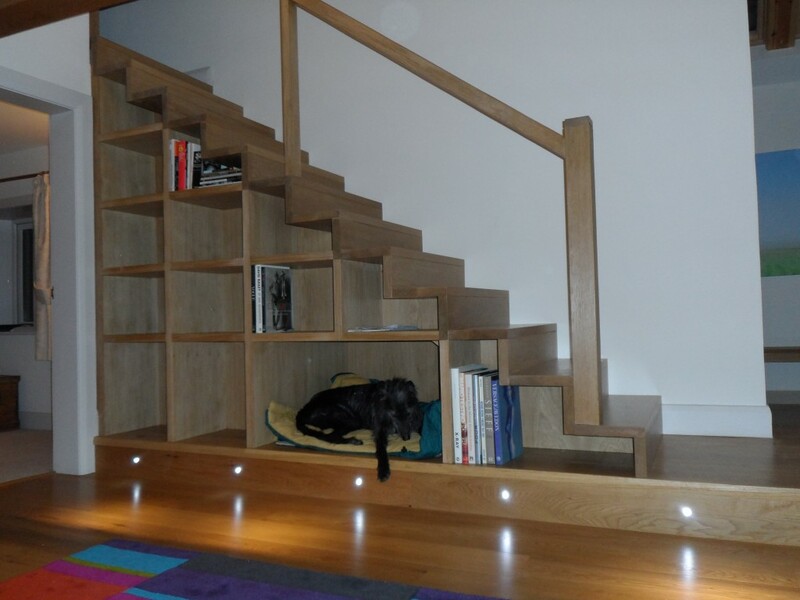 The shelving under the stairs is made of oak veneered MDF. Tomorrow the horizontal shelves will be installed. 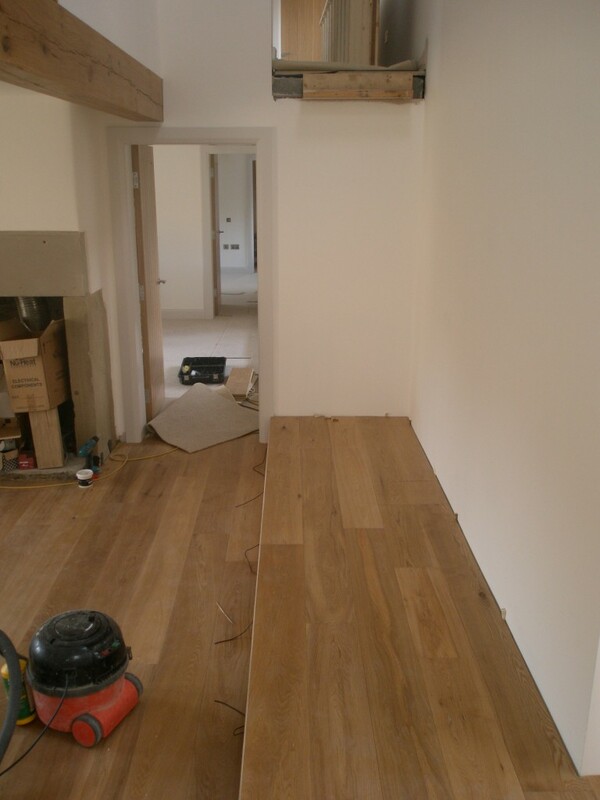 Once all of the verticals and horizontals are in place, the wood will be varnished so that all the oak matches. We have installed the knewl posts and the handrail (albeit temporarily) to allow the templates to be cut for the glass panels. These will be held in place by grooves cut into the knewl posts. Hence the posts (and handrail) will have to be removed to install the glass. 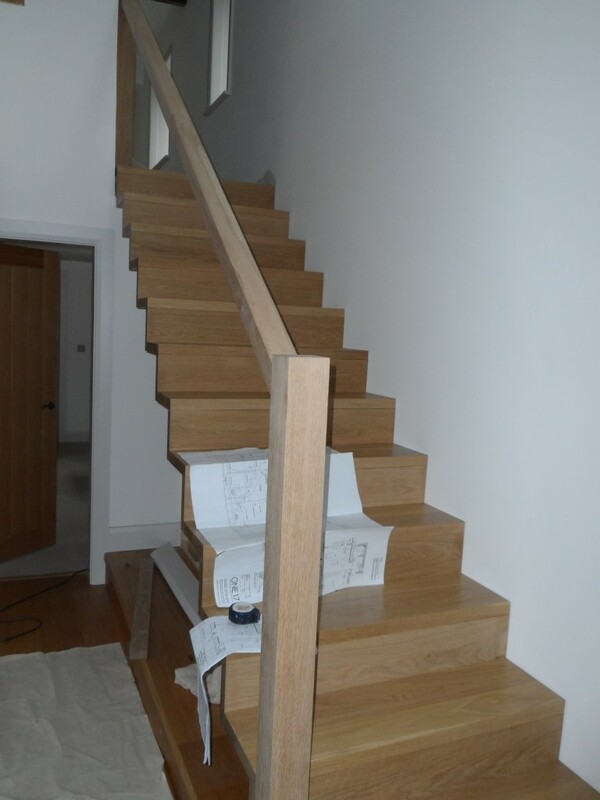 The posts and the handrail have not been varnished yet, hence it looks a different colour from the rest of the oak. The knewl posts and handrail are temporarily put in place allowing us to cut the templates for the glass. Well, these have only been fitted temporarily allowing us to cut some hardboard for the glass panels that will be installed. 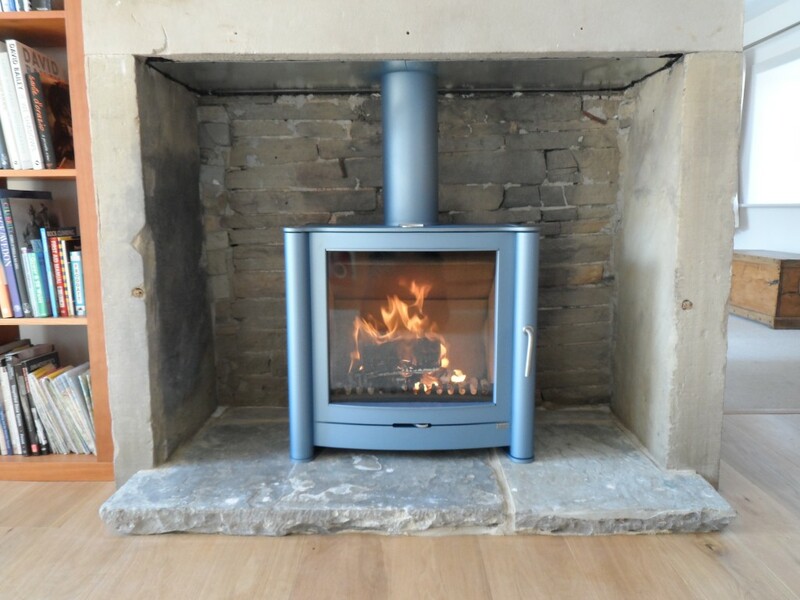 There is a 1-2 week lead time on the glass once it is ordered. The plan is to carry on with the shelving underneath the stairs while we are waiting for the glass. 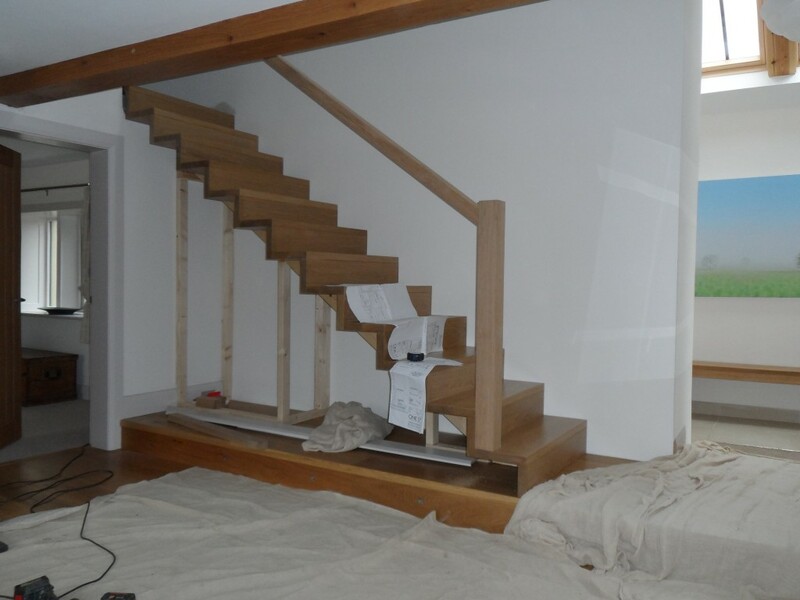 Well, it is the end of day two and we actually have a set of stairs that you can walk up – albeit without a hand rail. 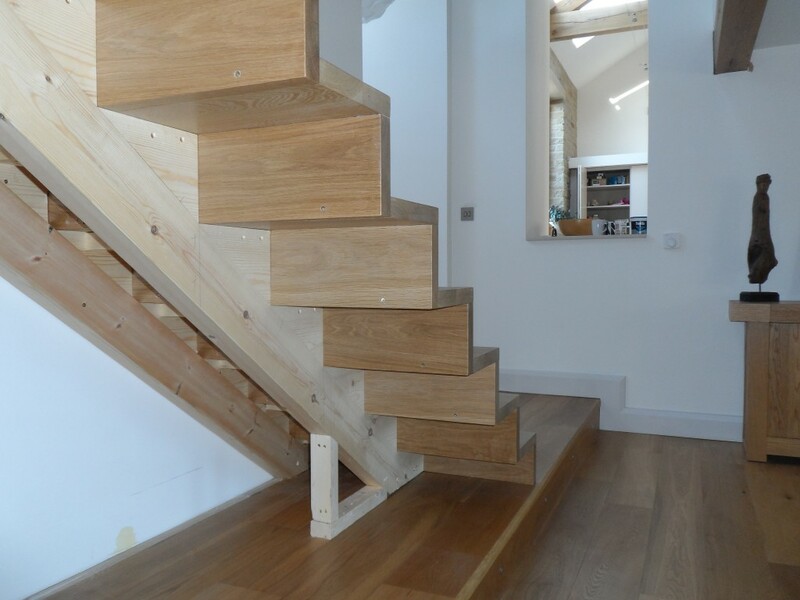 The treads and the risers are made of solid oak. These are glued and screwed to the softwood frame underneath. Here we have half of the treads in place. Treads and risers being glued into position. Only the top step is left to install. 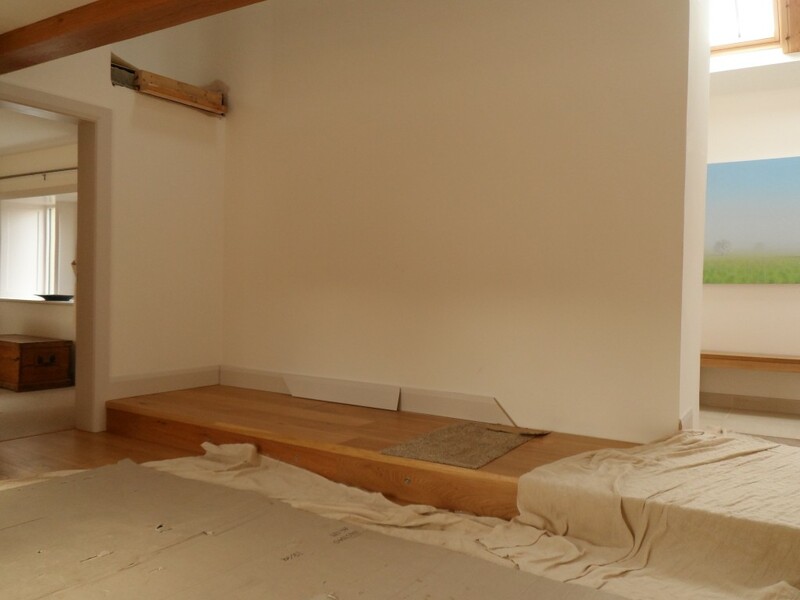 The space under the stairs will house book shelves. The treads and risers seem to “float” over the edge of the internal splines. This staircase feels so much more solid that the temporary one we had installed before. The new stairs without the shelving underneath. 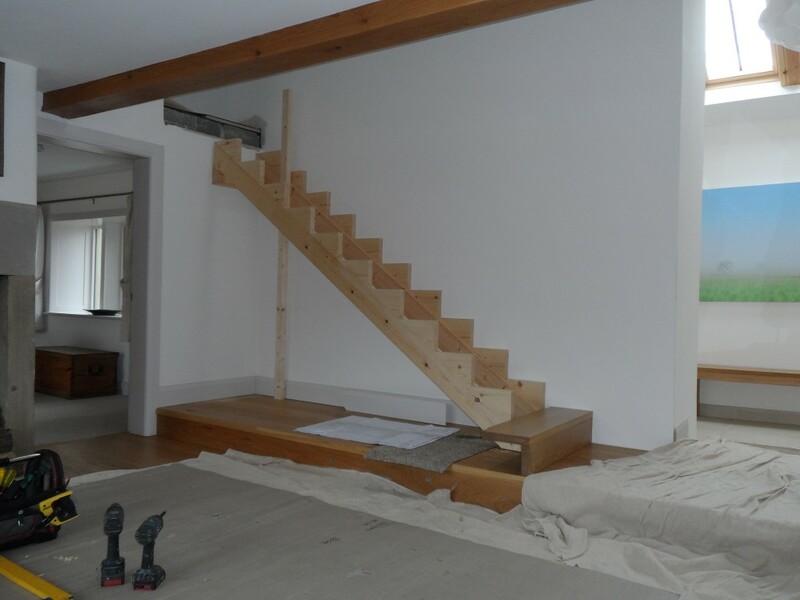 It is going to take a few days to get the new staircase installed. The first part of the job is to remove the temporary staircase and build the skeleton that is going to carry the new treads and risers. 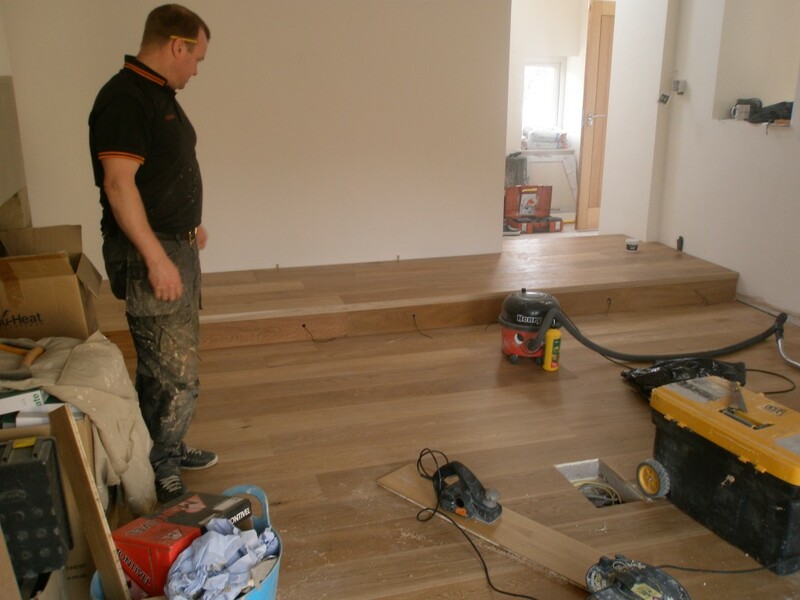 The splines had been made in the joiner’s workshop and it is then a case of fitting them on site. Even so, this took a whole day. 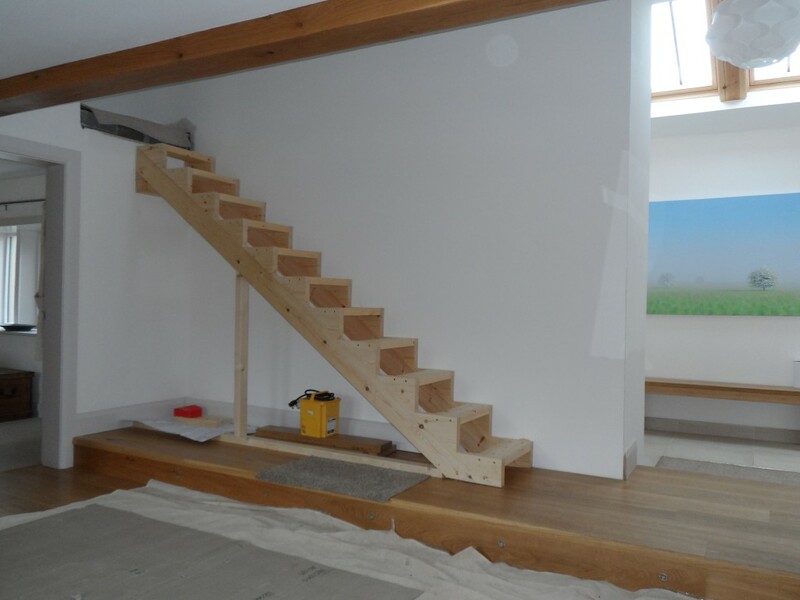 Tomorrow, the oak treads and risers will be installed. 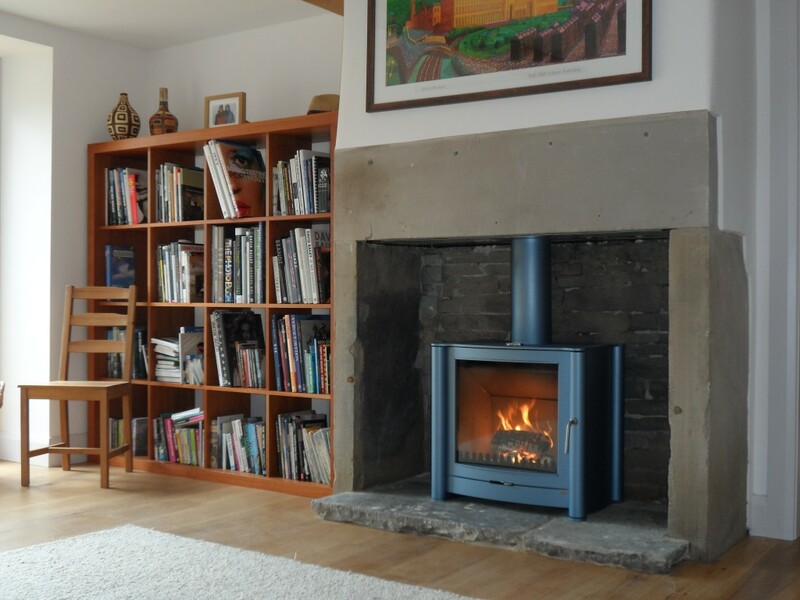 We bought these as a temporary measure when we were renovating the property. It didn’t take long – 4 screws and it was gone. 30 minutes later and the chainsaw had done it’s job. 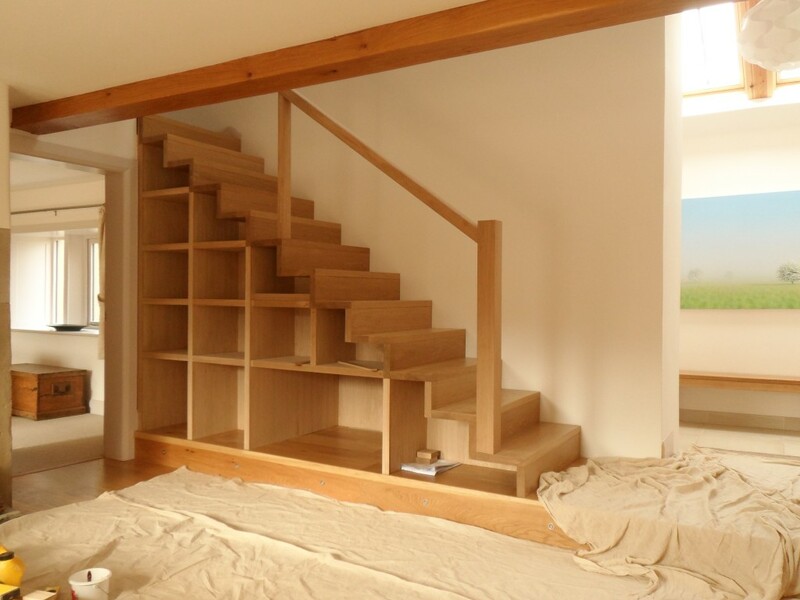 There will be two splines that will carry each of the oak treads in the new staircase. 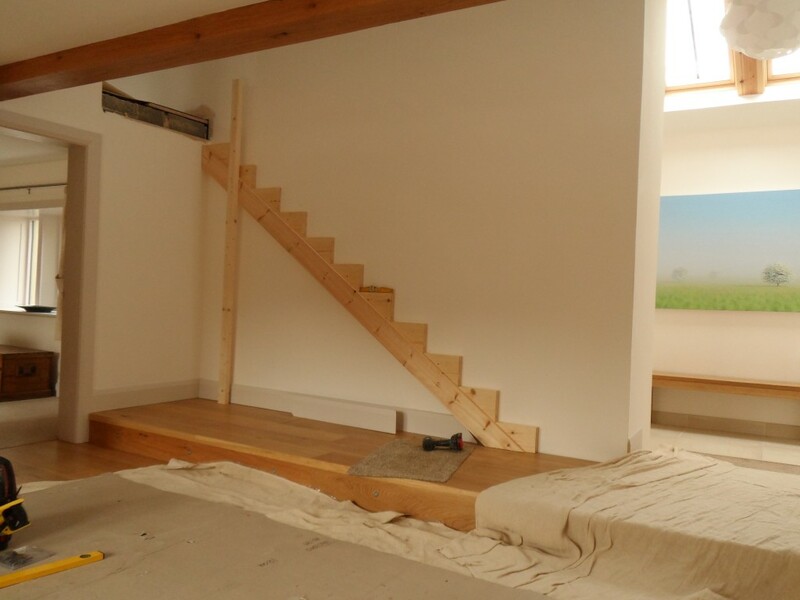 Once the stairs are in place. The shelves and cupboards will be built to suit. The treads and the risers are going to be fixed to the two splines. You can see the bottom tread and riser in place. 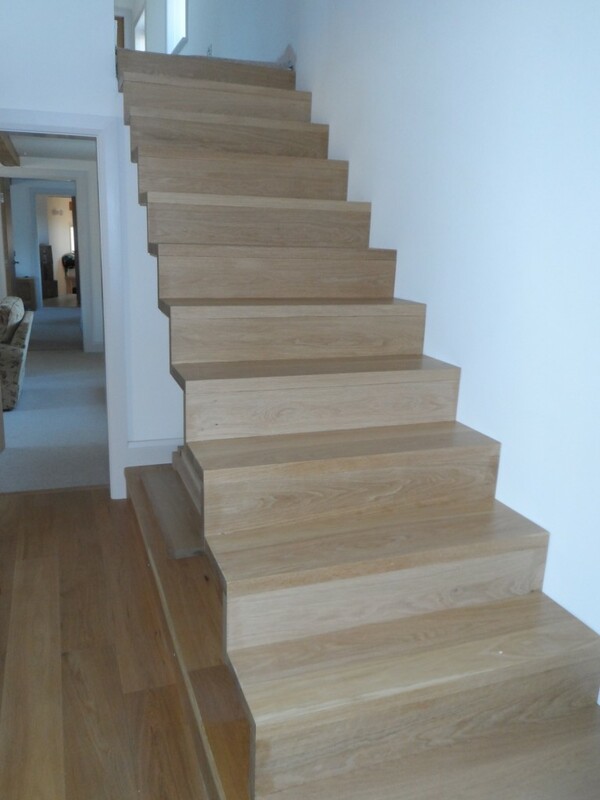 The treads and risers are made of solid oak. The two splines are then joined together with pieces of software. The treads will then be glued to these (and screwed on from underneath). Bar a couple of small areas, the work on plastering the kitchen is complete. This is just as well since the decorators start in here next week! Our attention has turned to finishing off the plastering in the older part of the property, including the double height hallway. The two largest walls were completed today. Despite the fact that we had no water on site. There appears to have been a burst water main locally and our water stopped just before lunch. We managed by filling up some 5 gallon drums in the village and transporting them back to site on the pickup. Each of the large walls needs to be completed in one go. Due to their size, this means having one plasterer work upstairs while the other is working on the lower part of the wall. This can be tricky at times! Ian is working on the upper part of the hall way, while Mark is working on the lower part! It all takes a lot of coffee and lucozade. We have started to make the openings between the two properties. This will take a couple of days to complete. The concrete lintels have to go in first before the stone underneath can be removed. 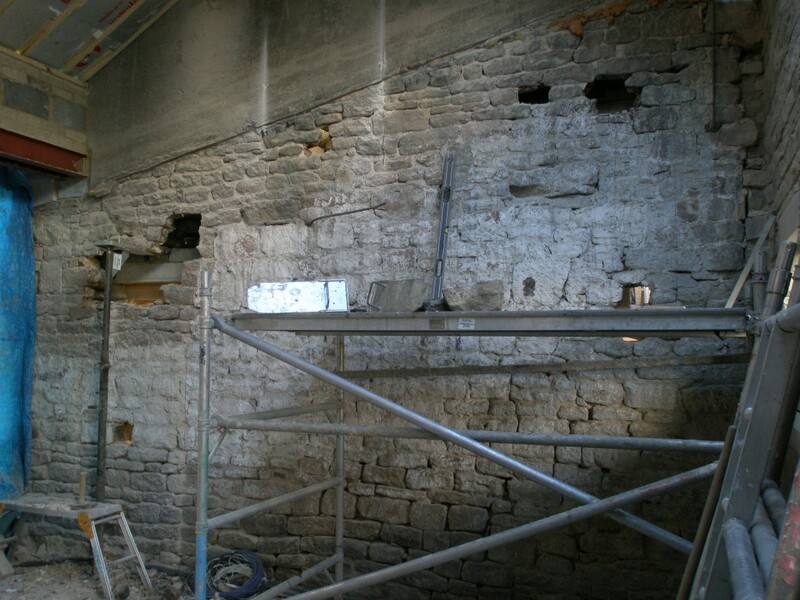 However, we already have a couple of holes in the wall that give a glimpse of what it is going to look like! There are three openings to be made in this wall – a small balcony high up, an internal window that looks a long the edge of the kitchen units and the doorway between the hall and the kitchen.